Enter your name and email to register for the FREE Bulletproof Certainty Webinar Training by Dr. Dan Sullivan D.C.
*This is a live event. Replay will be available for those who opt-in only. Learn How Today's Research Supports Chiropractic and the Power of the Chiropractic Adjustment! This is a 3-part video training series that we are kicking off with a live webinar - you'll get instant access! Learn the Simple Yet Irrefutable Science that Most People (including MD’s) Do Not Know! Understand the Best Science that Backs Up the Power of Chiropractic and How To Communicate it to Anyone! After this Training You’ll have the Certainty to Enter Any Room with Anyone and Passionately share the Truth about the Power of Chiropractic! Enter your name and email to register for the Bulletproof Certainty Training! 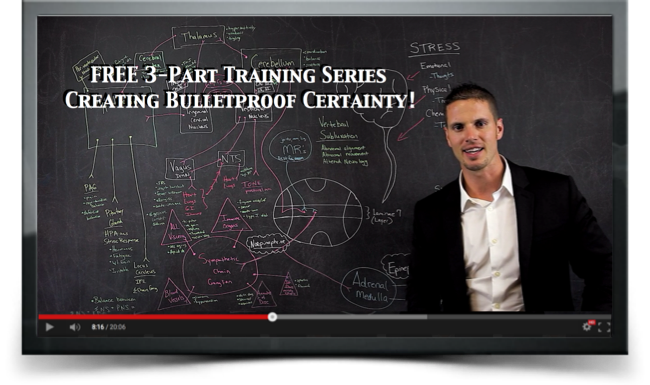 Fill out the form below to get instant access to the Bulletproof Certainty Training Series. You'll receive 3 training videos on the science, research, and mindset required to create Bulletproof Certainty in your practice. Get Ready Because Your About to Learn The Research and Science Behind one of the Most Powerful Health Care Professions in the World! You Don't Want to Miss This!